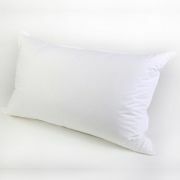 Down Pillows - View our range of Down Pillows here at Anthony Ryans linens shop, offering excellent quality Down Pillows to suit your needs. Down feathers are a natural product. So only if you are specifically allergic to feathers, or any other product in the construction of your pillow, should a feather pillow cause a problem for you. As a natural product they are 100% breathable, dust-mite resistant, anti-bacterial and generally easy to care for. Down feather is the smaller feather from the bird’s chest and wings, generally softer, cosier smaller, and lighter making a down pillow a luxury product. With down you can manipulate into the shape and height that suits you. 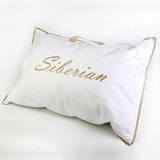 More often than not there would be a combination of feather and down in a pillow. 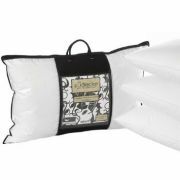 The higher the down content the more expensive the pillow would be. Down feather pillows are normally machine washable and suitable for home dryers but can take time to time to full dry and come back to the original downy consistency.